The ASHA workers work on a voluntary basis. Though they don’t have any monthly salary, they get some incentive as per their performance. They also receive financial assistance under the central government schemes. The ASHA workers also sell health care products in the rural areas. These products include condoms, sanitary napkins, and contraceptive pills. The amount of their incentives depends on their sale. Recently, the central government has announced that all ASHA workers will receive Rs. 500 as Protsahan Rashi. These health care workers will also receive insurance coverage of Rs. 4 lakhs. PM Suraksha Bima Yojana and PM Jeevan Jyoti Bima Yojana are the two projects, which will contribute towards this insurance policy. Hough there is no fixed salary for the ASHA workers; the Andhra Pradesh CM has announced that these health care workers will receive a fixed salary of Rs. 3000. Accredited Social Health Activist is popularly known as an ASHA worker. They operate in rural as well as urban areas. They play an active part in informing people about healthcare. 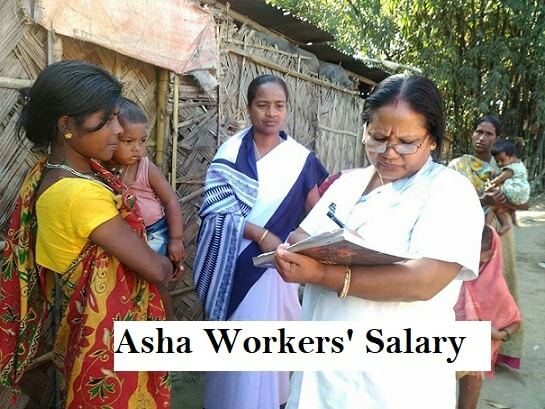 ASHA workers get training and bridge the gap between the commoners and health care facilities. They mainly work with people who belong to the financially weaker backgrounds. A quick look at the table above shows that there is no parity in the salary of the ASHA workers. In some states, ASHA workers are paid handsomely, while other states hardly compensate them for their services. In some states, the payment is not regular. All these issues have infuriated the ASHA workers. A number of protests have been organized in several states. States as well as central governments are trying their best to come up with a permanent solution. For the time being, Modi has announced a hike in the remuneration of ASHA and Anganwadi workers to appease these protests. Without the assistance of the ASHA workers, the primary health care foundation in rural areas will collapse.